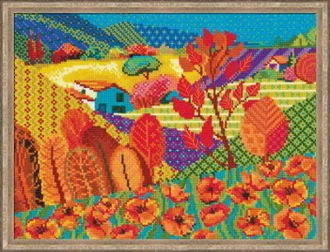 An exquisite counted cross stich design with a lovely scene of a Meadow with vibrant colors. Artist: Elena Kolmakova. Design size: 15.75" w x 11.75" h (40cm x 30cm). Color Chart, 10 count white Zweigart Aida fabric, Woolen and acrylic yarn (27 colors), a needle.